Owning a swimming pool is the perfect way to enjoy great fun with your family. It’s beneficial for your health, adds value to your home, and is a great place for gathering with your friends and neighbours for celebrations. Furthermore, a swimming pool is an attractive enhancement to your home, which can transform your garden into a magical oasis. It’s therefore very important to choose the right design for your pool as well as to consider landscaping possibilities and the overall aesthetic impression of your garden. It might seem very easy, but choosing the right design for your pool can be a daunting task since there are so many different possibilities and options nowadays. Here’s a list of several elegant and original swimming pools that can inspire those who are about to purchase a new swimming pool. Spence Manor, a complex of condominiums, was once a hotel of suites famous for having Elvis Presley as a guest while he was recording music in Tennessee. It’s right across the street from the Country Music Hall of Fame, so the owner came up with the idea to install a pool that was shaped like a guitar to draw the attention of tourists. The hotel is no longer functioning; however, the guitar-shaped pool is still there and people who live in the surrounding complex of condominiums can use this curiosity. 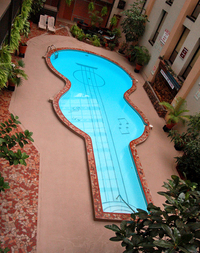 Furthermore, the popularity of the guitar-shaped pool has spread all across the country and many famous movie people from Hollywood came here to shoot several sequences for their movies. The design of the pool is brilliant, including small details such as the strings that create the image of that round opening in the guitar, as they are painted in black at the bottom of the swimming pool to look just like a guitar when seen from above. In general, rooftop pools create an impression of luxury and uniqueness. OMA, an architecture and design firm, did a great job incorporating style, elegance, luxury, and originality into this rooftop pool, which is part of a custom-designed house just outside Paris. The residence consists of two separate apartments that are connected by a rooftop pool with a beautiful panoramic view of the city. Can you imagine anything more romantic than having a night swim with a view of the Eiffel Tower? 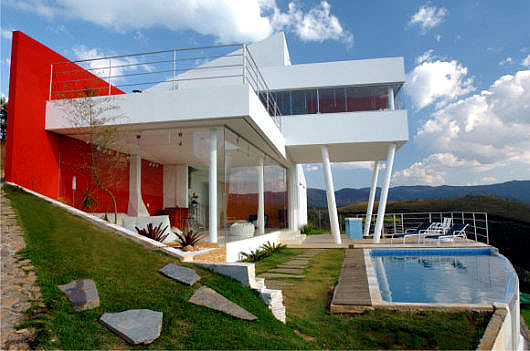 Brazilian architect Ulisses Morato designed a breathtaking, award-winning contemporary mountain home. It’s a perfect example of how modern pragmatic design and beautiful nature can distinguish and highlight one another at the same time. This innovative modern house is constructed on three levels and makes use of the steeply sloping plot as effectively as possible. The cream of the crop is an infinity pool installed in this stunning architectural and natural surroundings. This pool makes you want to jump in and enjoy the view of those beautiful rolling hills. Scott Cohen, a well acknowledged designer who owns a premiere landscape design and construction firm in the Los Angeles area, created a luxurious Tuscan-inspired spa with an original and impressive water feature for an extra relaxing effect. Not only does this spa ideally fit into its setting, but it also provides a great calming effect and relaxing there makes you feel like a Roman emperor. 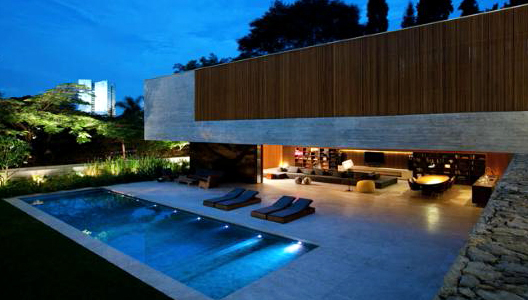 Another Brazilian architect, Marcio Kogan created an astonishing design of this exposed concrete house located in Sao Paulo, Brazil. The Ipês House, made of heavy material, has amazing charm. It seems like it floats above the glass volume of the lower floor. The veranda and garden, which retracts almost the entire length of the building, is directly connected with the living room and a huge set of pivoting wooden panels reveals the side, making the living area an outdoor space. The pleasing atmosphere is created by genius lighting and an aesthetic pool, which provides a lot of free space suitable for family celebrations and parties. The rich wood continues into a simple and contemporary interior that contains banks of shelving and entertainment units. The heart, a universal shape for love, is more and more popular in the swimming pool industry. Love is in the air and apparently also in the water. A heart-shaped swimming pool might be a nice wedding anniversary present for your beloved heart. Park Place Condominiums in Albuquerque is home to a very nice heart-shaped swimming pool that has enough love for at least a dozen people. Swimming pools are much more than tanks filled with water where you can swim. They represent comfort, relaxation, and enjoyment. And where else can you forget about all your problems than at the top of the world? 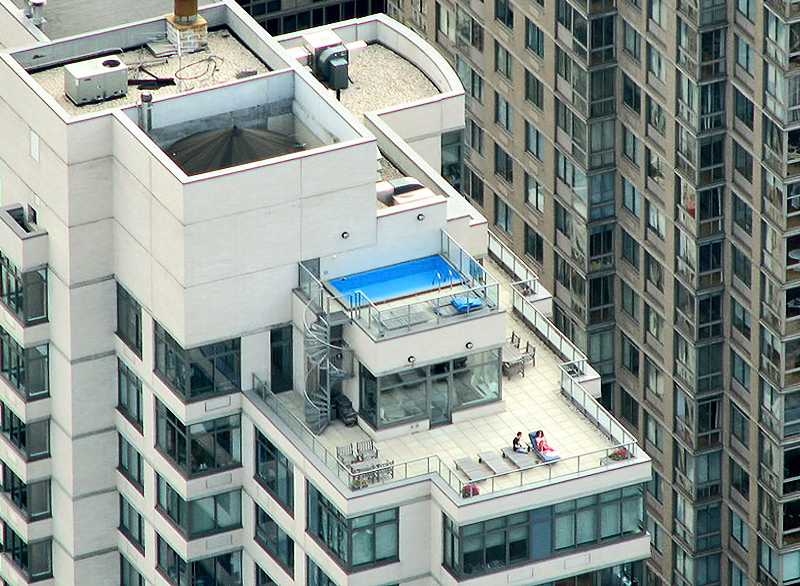 This rooftop pool may be small and pinched but swimming at the top of a Manhattan skyscraper, far away from the busy metropolitan life, is like escaping the earth and relaxing among the clouds. A tremendous residence like Lexington Rd. 1506, which is on sale for approximately $24,475,000 has to include a fabulous swimming pool. Everybody would agree that a 50-foot, glass mosaic saltwater pool meets the criteria. It’s like owning your own small piece of the sea. Andrés Remy, a prestigious Argentinian architect, is well known for designing unique swimming pools that he perfectly fits into the setting. This glass-walled swimming pool is raised so that there’s more sun. 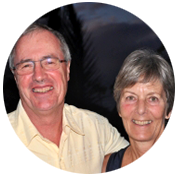 This creative solution combines features of contemporary design and rational functionality. This 26-foot-long and 8-foot-deep indoor pool is located in a townhouse right in the centre of the Chelsea neighbourhood in Manhattan. Right in the middle of the swimming pool is a swing and beyond the pool is a sun-flooded, 16-foot-high solarium leading onto a lush south-facing garden. The swimming pool became the focal point of this luxurious house, which is on sale for about $10 million.